It feels fitting to me that I finished this print now, just in time for the harvest festival of Thanksgiving. In this invented landscape I've imagined autumn 1620 in the Connecticut River valley, just a few months before the arrival of the Mayflower some 135 miles away. The Connecticut River valley is where I live, in the city now called Northampton. In 1620 both the people and the town here were called Norwottuck, which means "in the midst of the river." The hills I've depicted are imaginary, in the sense that no such view of the Connecticut River exists, but the yellow hills in the distance roughly outline three of the seven peaks that make up the Holyoke Range of central Massachusetts and the large orange hill in the center of the print is based on the shape of Mount Sugarloaf just up the river in Deerfield. Deerfield is where the last Indian war in Massachusetts occurred in 1704. 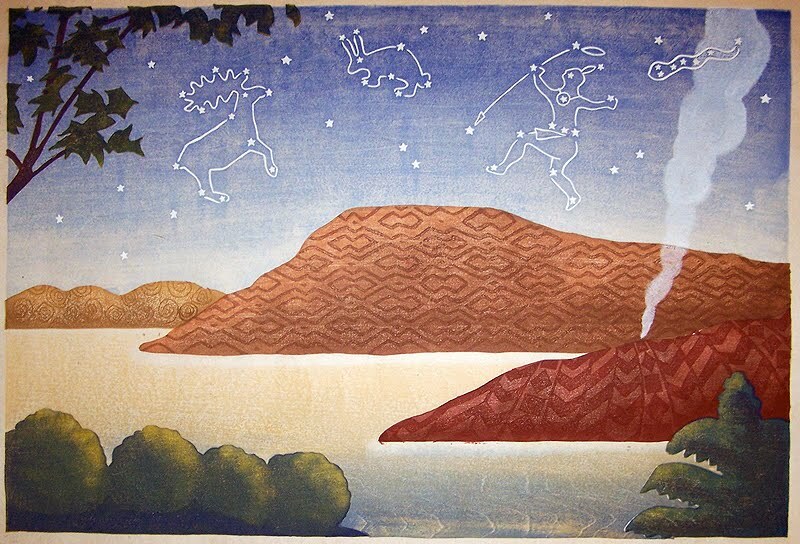 As I described in an earlier post, the patterns on the hills are based on surviving patterns from the neighboring Iroquois and Mohawk nations (originally from upstate New York) and the constellations are imaginary, just me trying to imagine how a culture that subsisted off the land in a migratory way, both hunting and fishing and planting crops seasonally, might see the stars. Working on this print made me feel sad and tender. I love this valley, this river, this land. The Connecticut River has sustained my family for many generations. And this same land sustained many generations of people before my ancestors ever saw it. Those native people are invisible to me in my everyday life. I felt myself calling them forth as I worked on this print. This "We Are Pilgrims" series of prints began as an exploration of my own ancestral roots, but my European ancestors would never have survived without the assistance of the Americans who knew this land, these seasons, these animals and plants. For those native Americans I am thankful. Happy Thanksgiving. Way back two months ago I taught a workshop at Zea Mays Printmaking that we named "Experiments In Woodblock Printing." It was a short two-day workshop, way too short to create an edition of multi-block prints, so I decided to focus on printing techniques. I asked participants to bring a very simple design or two designs that could interact because we were only going to carve two blocks. We spent only the first 4 or 5 hours on carving. The rest of the workshop was about printing, and each participant worked with two carved blocks plus an uncarved block. I didn't file a report about this workshop as I usually do because I didn't take any photos, but I recently got some pictures that the Zea Mays staff took, so here are some for you to see. I demonstrated five or six basic techniques at a time, and did three series of demos during the weekend. Trying out some moku hanga "wiping"
It worked! I was winging it in these demos, which I wanted to do so that participants would feel free to wing it too. Another reason I'm posting about this workshop now is because this latest print I'm working on takes a similar tack as the workshop in that unlike many of the prints I've done in the past that relied heavily on detailed carving, Vast Unpeopled Lands uses only four blocks. Most of the heavy lifting has been accomplished through the process of printing (25 impressions and counting). I learned a lot and loosened up too at this last Zea Mays workshop. Thanks to all the participants who experimented with me. It was a much more playful workshop than usual and I enjoyed watching your prints develop and change. More studio time this morning. It feels so great to be making progress on this print. Today I worked with the greens. Actually, I got these deep greens by printing blue on top of that yellowish azo green. I still want to develop these front elements a little more. I want them to be very dark so that the hills seem to glow in contrast. This weekend I added a few more impressions to Vast Unpeopled Lands. The photo you see above represents 18 distinct impressions (that is, I've printed 18 times so far from the 5 blocks I've carved). Unfortunately I couldn't find any design sources for native Massachusetts tribal patterns, but I did locate these designs, based on surviving patterns from the neighboring Iroquois and Mohawk nations (originally from upstate New York). The native Americans of New England had very different beliefs and ways of interacting with the environment than the English who arrived in the 17th century. The Americans subsisted off the land in a migratory fashion, both hunting and fishing and planting crops seasonally. Through the use of small controlled forest burnings, movement between different areas of food sources through the year, low population densities, and the use of multicrop agriculture, the impact of the native population on local ecosystems was fairly small and consistent. The Europeans, however, relied on livestock which had a huge impact on the local ecosystems. Europeans cleared vast amounts of land, relied on settled rather than migratory agriculture, introduced fences and notions of individual ownership, and viewed the products of the land as commodities to be claimed. These differences in understanding about ownership and use of land led many of the newly arrived Europeans to believe that the land they saw stretching out before them was uninhabited, virgin, and there for the taking. In many ways they were literally unable to see the marks of the cultures that already lived there. Back in the studio again today -- yay! I added some burnt umber here and there on the hills to give them some shape. Might have to do it again in some spots; we'll see as I deepen some of the other colors. Not much to say, but I'm very happy that I got some time to print this morning. Added some red oxide and some green. Lots more still to come, these are just the base colors. Wow, I've made two trips to New York in 9 days. Not bad for a woman who used to be terrified of the place. Maybe it was my trip to Tokyo in 2005 that cured me of my city phobia. Whatever the cure, I'm becoming quite enamored of the Big Apple. On Saturday I took the annual Smith College Museum of Art members' bus trip to NY for the IFPDA Print Fair for the third year in a row. It was well attended and I saw a lot of interesting and inspiring work. One of the first booths I stopped at was The Art of Japan. This duo from Washington specializes in Japanese woodblock prints and they had a mind-boggling collection of my favorite genre, sosaku hanga (the self-carved and self-printed work created in early 20th century Japan). Handling works by the likes of Masao Maeda (above), Koshiro Onchi, and Umetaro Azechi literally brought tears to my eyes, as I've studied their work online and in books ever since I started making prints. I was amazed at how sloppy the great Onchi's prints appeared, with so much ink in the margins. I sat with the prints for a long time, and I'm sure I wore out my welcome, as I couldn't afford to buy any of the pieces I really wanted. There are a few big contract printer/ publishers that I always visit, and one of them is San Francisco based Crown Point Press. This year the Crown Point piece that stood out to me was Back to the Land by Swedish artist Jockum Nordström, best known for his collage work. The primitive, mysterious and vaguely historic feeling in his prints appeals to me. I found a YouTube video interview with Nordström about his work at Crown Point here. One artist whose work always stops me in my tracks is Chinese artist Hung Liu. 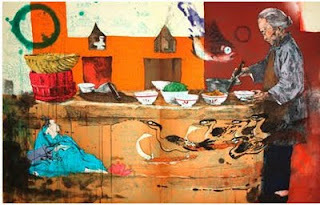 A painter, Liu has also worked extensively making prints with both Paulson Press and Shark's Ink. 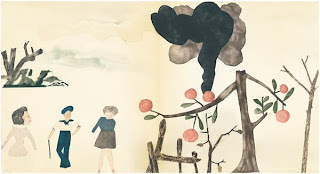 The piece above is a piece she made at Paulson Press called Stove. Hirschl & Adler Galleries always has work by Arthur Wesley Dow (left), Blanche Lazzell and Gustave Bauman. I spent a long time standing in their booth mentally spending several tens of thousands of US dollars. Another really standout display was a group of maybe 8 or 10 color woodcuts by Wassily Kandinsky shown by Chicago's Worthington Gallery. 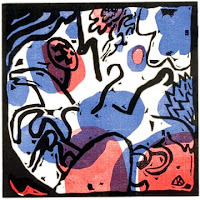 I had no idea that Kandinsky had done so many woodcuts. The piece to the right, called Three Riders in Red, Blue and Black, was my favorite. And maybe the most fantastic thing I saw at the Fair was a woodblock print scroll by Chinese artist Yun-Fei Ji called Three Gorges Dam Migration at Carolina Nitsch Contemporary Art. This ten-foot-long horizontal image, hand-printed in China from over 500 hand-carved blocks of pearwood, depicts the flooding and social upheaval caused by the construction of the Three Gorges Dam on the Yangtze River. It's almost impossible to fathom how this work -- a collaboration between MOMA, the artist, and a Beijing woodblock printing workshop called Rongbaozhai -- was printed. It's stunning to behold. Detail from Three Gorges Dam Migration. It was a great Fair, and I've only scratched the surface of what I saw. It was crowded the whole time I was there, and there appeared to be a lot of money changing hands, so based on this one experience I'd have to speculate that reports about the death of the art market are overblown, at least for the print market. Yay prints! When this is what you see out your window, it's hard not to use yellow in your artwork. So I've been using some yellow and orange today. In native American news, President Obama met yesterday with leaders from all 564 federally recognized tribes at a Tribal Nations Conference. According to the NY Times "He vowed that there would be no more 'going through the motions' and that his administration would finally face the severe economic and social problems that are the result of centuries of federal abuse and neglect." Argh, I feel like I can't get anything done! I have such a backlog of prints I want to make and the day job is keeping me in front of the computer too much for my liking. I know, I'm going to like the income in a couple of months, but meanwhile I've been feeling frustrated. So I've gone back to a habit I developed the last time I had a lot of commercial work, and that is to set aside a non-negotiable hour or two every day for studio work. That way I don't lose my momentum. Losing momentum is just about the scariest thing I experience as an artist. It feels dangerous, like if too long a time goes by I'll just never pick it up again. So off I go, for today's hour and a half of carving. Oh, and lots of commenters from my last post talked about the meditative quality of carving, especially compared to the intensity of printing. I completely agree. Even in little one-hour chunks, carving is deeply satisfying and relaxing and the time flies by. Been slowly working on three more blocks for the "Vast Unpeopled Lands" print. The patterning shown here is the most complex carving; the other two blocks are pretty simple. I'm going to try to get most of the nuance from the printing rather than the carving. These blocks are so big, though, that even simple carving takes some time, especially clearing. Hopefully I'll be back to printing later this week.